But who are they? Velma with her insightful logic, the laid-back hippy Shaggy, Scooby-doo who is scared of everything but who still manages to catch the villains, Daphne with her….well, whatever it was that Daphne contributed to the gig, and Fred who single-handedly turned the butch neckerchief of the cowboy into the gayest bit of clothing that the 70s ever witnessed. …and what about the interminably irritating Scrappy Doo? The Jar Jar Binks of the Scooby gang….. Which court cards would you associate with each character and why? I'm pretty sure Daphne owned the Mystery Machine so it was her money/pentacles that allowed everyone to travel. Perhaps she's the Queen of Pentacles. 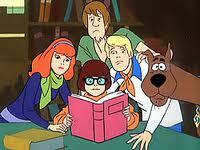 See – even the makers of the cartoon didn't know what to do with Daphne! In the movies it helped that she was played by Sarah-Michelle Gellar of Buffy The Vampire Slayer fame. That gave her a bit of kudos! But I am astounded that they actually have a Wiki lol! From the Wiki article. LOL The roles of each character are strongly defined in the series: Fred is the leader and the determined detective, Velma is the intelligent analyst, Daphne is danger-prone, and Shaggy and Scooby-Doo are cowardly types more motivated by hunger than any desire to solve mysteries. Later versions of the show would make slight changes to the characters' established roles, most notably in the character of Daphne, shown in 1990s and 2000s Scooby-Doo productions as knowing many forms of karate and having the ability to defend herself, and less of a tendency towards getting kidnapped. I think Daphne did help out. 🙂 Too easy to say she was the pretty one because that intimates that a pretty woman is dumb. To make men feel better about themselves. Seriously, I see this as a typical genderized set-up. Undesirable girl = glasses, smart and not so attractive. Desirable girl = pretty, needs saving, good clothes. It's a good indication of the training we received as children (and still receive as adults) about what men "should" want in a woman. Velma is the Knight of Swords for always seeking. Shaggy is the Knight of Cups for his emotional responses. Daphne is the Page of Swords. She wants to be a sleuth but gets overlooked because she's the pretty one. Fred is the Knight of Pentacles. He can drive the van but he isn't the quickest on his feet. Scooby is the Page of Pentacles because he just wants his Scooby Snack. Velma is Page of Swords, a studious type who likes to see things from both sides, solve puzzles and in general show off her superior knowledge. Daphne is reverse Queen of Wands, all artifice and 'look at me, I'm the pretty one'. That's her only contribution. Fred is Knight of Coins. If anyone is ramrod straight and plodding, I think it's Freddie. Scooby is the Fool, I think. He never takes any of it too seriously, even when supposedly running for his life. That's not a court though. Shaggy is Page of Pentacles reversed, curious about the world around him, but only to the extent that his comfort is seen to and his belly is fed. Freddie as Knight of Coins – I can totally see that! Like it Ania! What WAS the point of Daphne in that cartoon? !